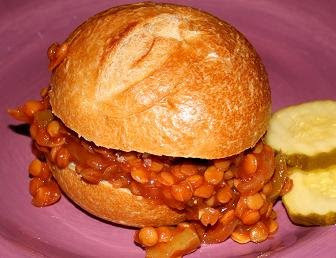 Here's a very simple recipe for vegan "sloppy joes". Cook 1 bag of lentils according to package directions. Add a couple diced bell peppers and a diced onion to the lentils as they cook. When the lentils and veggies are tender, stir in a big can of Manwich sloppy joe sauce, some ketchup, and a bit of BBQ sauce. Heat everything until the sauce thickens. Simple and good!